"Based on Dickens' own performance adaptation, Simon Callow and director-designer Tom Cairns have created a one-man theatrical extravaganza of festive story-telling that is both heart-warming and deeply moving. A Christmas must see for 8-88 year olds! 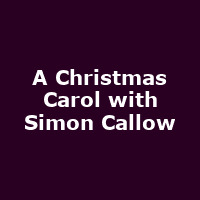 Using the adaptation Dickens made for his own public performances, Simon Callow and director and designer Tom Cairns have conjured up a moving, funny and fast-paced one-man theatrical spectacular that will leave you with a warm festive glow. Dickens takes us on a man's astonishing journey through his past, his present and (terrifyingly) his future, led by his three ghostly guides. Will Ebenezer Scrooge, tight-fisted, cruel and bitter, finally re-join the human race and learn to embrace the true generous and humble spirit of Christmas?"